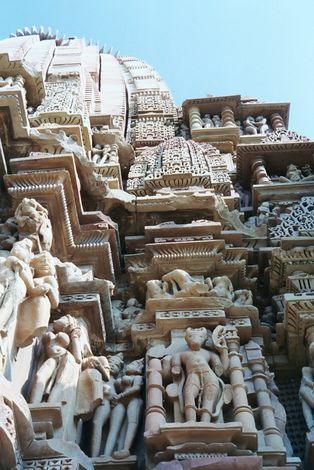 The Khajuraho temples are famous for their minutely sculpted exterior surfaces, explored here. The shikara of the Mahadeva. 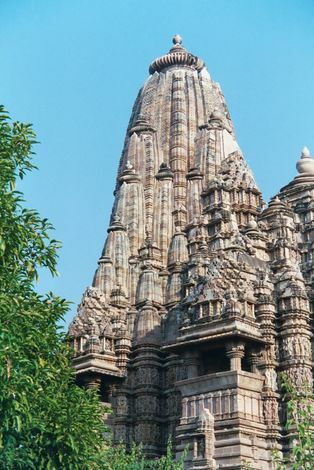 Tower and sanctuary together form the vimana. The shikara is covered with miniature shikaras known as kudus or candrashala; each represents the home of a god. 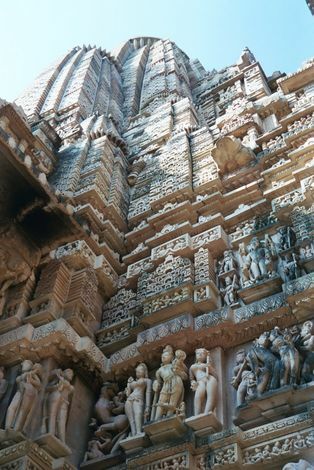 The large fluted disk laid horizontally near the summit represents amalaks, or Indian gooseberries, associated with Vishnu and regeneration. Above it is the amritakalasha, a vessel holding amrita, the nectar of immortality. 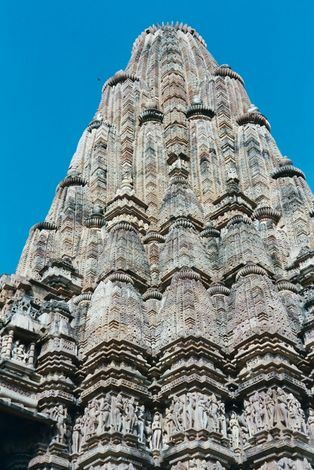 The tip of the tower represents the intersection of the divine and human worlds. 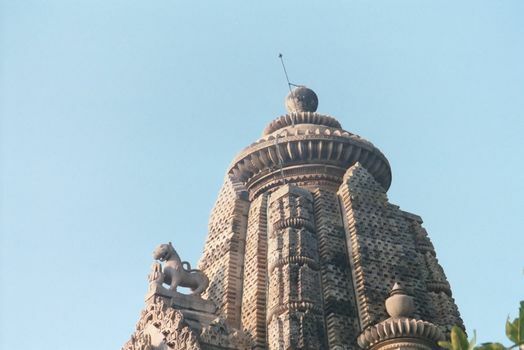 Close-up of the base of the Mahadeva shikara. 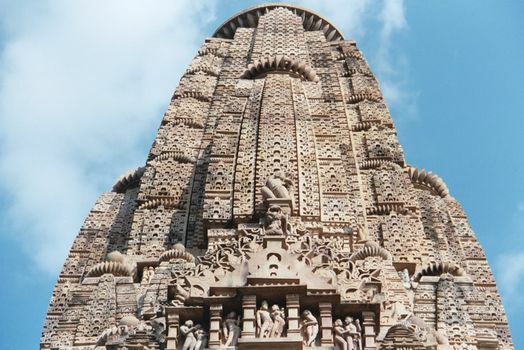 The stylistic similarities between the temples is very great: this is the Lakshmana shikara, built a century earlier. Base of the Lakshmana shikara. 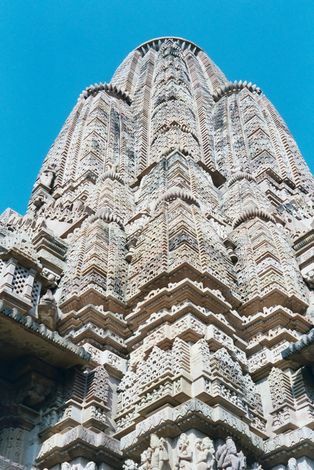 Lakshmana has the most completely sculpted surface of any of the temples. Here, the common motif of a thorn being removed from a foot. 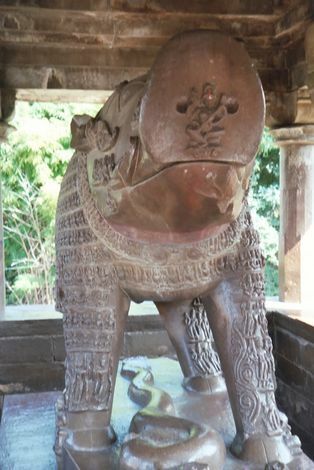 Another standard image: a shardula or leogryph, a horse-lion symbolizing the victory of knowledge over ignorance. 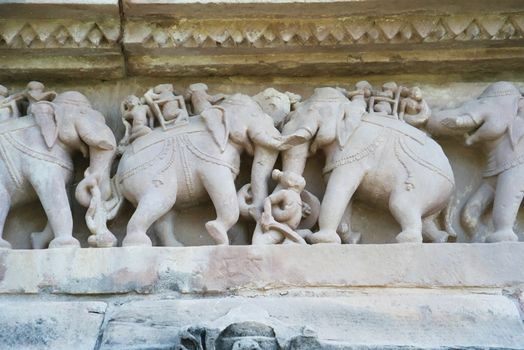 This one comes from the Javari Temple, a mile east of the main compound. Again from the Javari temple: a female figure in the stylized tribhanga, or "three bends," posture. 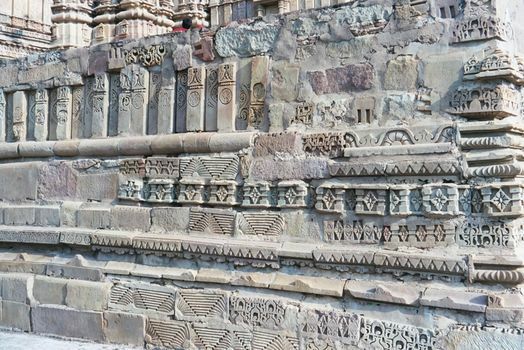 The Mahadeva plinth has unfortunately been none-too-carefully restored and lacks its sculptural bands. 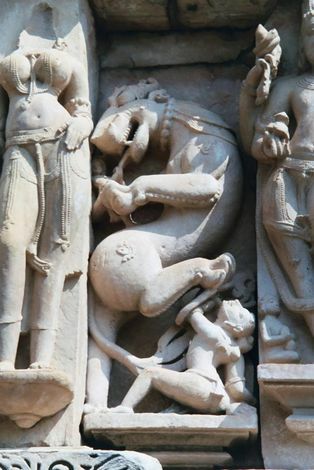 Not so Lakshmana, which is full of scenes from the all-too-temporal world. 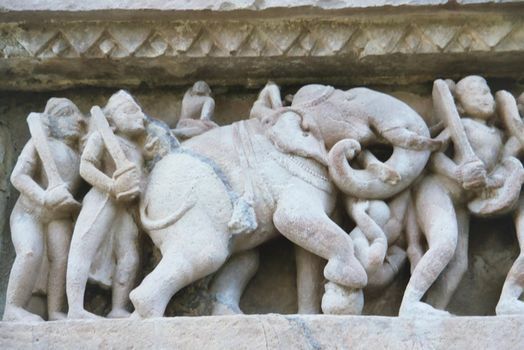 Here, elephants fighting and crushing human victims. A comparable image, again from Lakshmana. 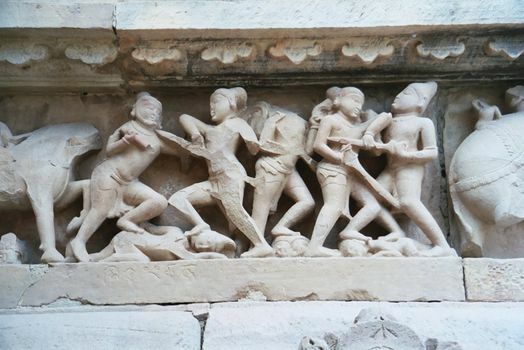 Bloody combat on the Lakshmana plinth. 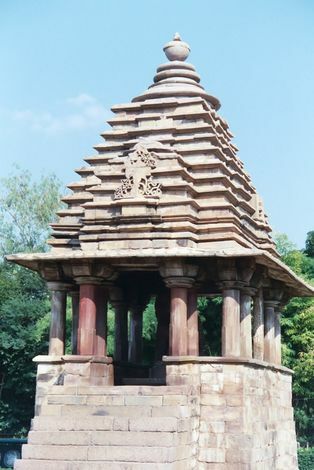 Near the Lakshmana Temple is the tiny Varaha Temple. It's easy to overlook. 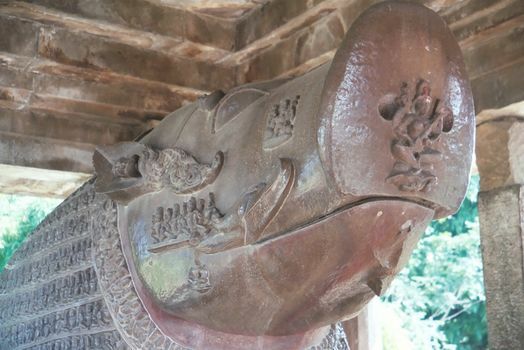 Inside is this statue of a boar--but not any boar: this is Varaha, the boar that is an avatar of Vishnu the Sustainer. 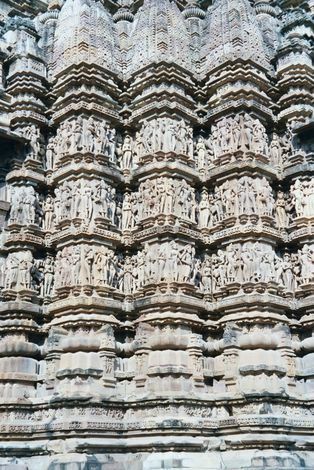 His body is covered with tiny figures--human and divine--all of whom he carries. 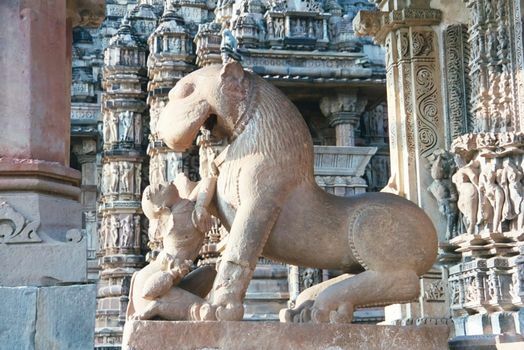 An icon of the Chandelas, the dynasty that built Khajuraho: a hapless man battles a lion.